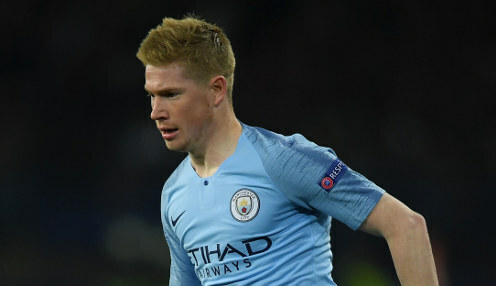 Manchester City playmaker Kevin De Bruyne accepts that some people will think his side have failed if they are unable to retain their Premier League title. The Citizens are currently locked in battle with Liverpool, with the Reds two points clear at the top of the table, having played a game more than the men from Manchester. If we don't win the Premier League, people are going to say it's a failure. And De Bruyne is aware that City will need to repeat their success of last season to keep everyone satisfied. He told the Manchester Evening News: "There's pressure all the time. If we don't win the Premier League, people are going to say it's a failure. "All we can do is try and perform well. At the end, even if we don't make it, I think we'll still have a great season. But obviously we want to win it and we'll see how far we go." City are currently priced at 1.72 to claim the Premier League crown, with Liverpool available at 2.10. Meanwhile, De Bruyne says he is happy to play whatever role he is asked to by coach Pep Guardiola, with the Belgian having seen his campaign badly disrupted by injury. He added: "When I play (start), I try to perform well and help the team win. "When I am on the bench, I try to come in as good as possible to help the team as well." City are back in action on Wednesday evening, when they will try to overturn a one-goal deficit from their first leg of their Champions League quarter-final tie with Tottenham Hotspur.